MacBook won't power on, what can I test? My Macbook suddenly powered off (split sececond to blackscreen, like a power outage). And since wont turn on again. My Macsafe connector shines dim green, (not sure if this was the case before). My battery indicator does not work. What are the test i can run to check what exactly the problem is ? Can i test if the logicboard is 100% fuctional ? how ? Did you get your system wet at some point? It sounds like you have a power issue inside. But you'll need to open the system up to figure this out. It was running on heavy load when it happend. I checked my cable and its 100% good, cause i checked it with a 100% working mac and the led shined bright green. On this macbook its verry dim green. I have no problem opening the macbook up myself, what can do/check to understand what the source of the problem is ? 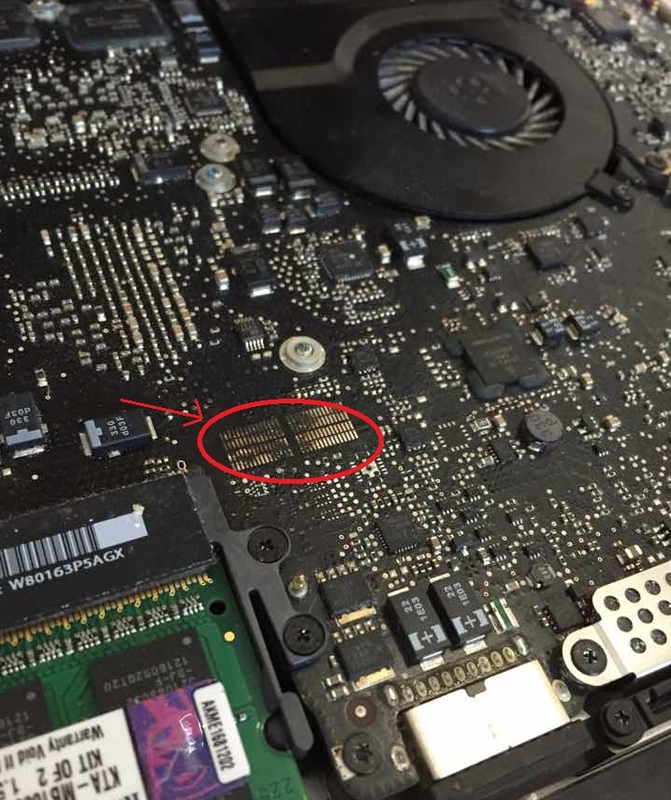 Follow this IFIXIT guide: MacBook Pro 15" Unibody Mid 2010 Logic Board Replacement to inspect the logic board. Look for any burnt chips or staining. Make sure you follow proper ESD practices as you don't want to damage things from static discharge. Post a picture of anything that looks questionable here for us to see. I have done this and i diddnt see any burnt chips or anything like that. When i tried to remove the logicboard tho, the head sink was kinda stuck to the stuff thats behind it. I guess thats the keyboard plastic foil stuff ? It was a little stuck on that and i had to kinda pull it from it. The discoloration around the tinned PCB area (lines) doesn't bother me too much as most get this way over time. It's the areas around the power logic that is a concern. Let's try this locate the battery tester ribbon cable and disconnect it. Does this allow you to boot up with only the MagSafe cable connected (battery disconnected). Is the MagSafe LED a brighter green now? Did this, it wont boot and the magsafe is still verry dim green..
Press the test button on the side for the battery, if it does not have at least a 20% charge it may not boot. Let us know your results. This led does not light up at all. Its been on the charger for extended amount of hours. If the battery is dead, which it appears to be, your machine is not going to start. Fix the obvious! Sorry im a bit of a noob, what should i fix then ? This board is a nightmare and not permanently fixable. Find yourself a schematic and a boardview for your board. Measure PPBUS_G3H, PP3V42_G3H, PP5V_S5, PP5V_S3, PP3V3_S5, PP3V3_S3, and report back what voltages are with charger plugged in and battery unplugged. If any voltage rail is not present, unplug charger, and measure resistance to ground on that rail. If you do not want to buy a multimeter, a boardview, or a schematic, you will never fix this, so please do not tell me you do not want to do these things if it is your intention to fix the board. So you conclude its something with the logic board, not magsafe or keyboard or anything else ? I haven't concluded anything, I asked you to take measurements so we have information which we can use to come to a conclusion. Ed DeHaas 가/이 대단히 고마워 할 것입니다.